The concept of justice has evolved in Tamil Nadu from tribal times and found its expression in the ideal of valour. The theme of valour is central to the subject of puram and enjoyed universal acceptance in the period in which Cankam literature was composed. Cankam literature does not treat valour in the abstract. It is in a concrete social context that a person's valour finds expression in Cankam poems. A king's valour is praised not because it is important in itself as a platonic ideal but because it subdues the enemy and brings protection and prosperity to the people. There are several poems in Puranānūru that show valour as connected with protection (Pura: 6, 12, 12, 17, 18, 20, 27, 29, 31, 33, 35, 40, 42). In Pura: 4, for instance, the enemy country devastated by the king is likened to a motherless infant crying in hunger. The country has lost the motherly protection of its king. Pura: 5, makes this point explicit. In it the poet advises the ruler to protect his country the way an infant is protected and nourished. This duty of the king to use force (danda) in order to protect is emphasised in ancient Sanskrit texts also. The king's duty is to uphold Dharma. The latter meant the varna order and caste hierarchy (Basham, p. 88, 138). But in ancient Tamil Nadu this Varna Dharma concept carried no weight. A.L. Basham refers to the absence of evidence in early Tamil Literature about the existence of caste (p.151). There is a poem in Puranānūru (6) which refers to the king as the eater of the enemy's earth and the holder of the sceptre of justice. This poem refers to Vedas, Brahmin sages and sacrifices in a reverential tone. But the justice it speaks of is the opposite of what the Brahminical texts conceived it to be. This Tamil poem insists that the Pantiyan king Muttukutumipperuvaluti, the performer of many (vedic) sacrifices, should be impartial like a balance used in weighing. The poem ends by comparing the king to the sun with its hot rays that punish and also to the moon with its soft, cool light. These are telling comparisons that go against the Sanskritic-Brahminical ideal of justice since the sun and the moon treat all people alike. These comparisons reinforce the poet's earlier exhortation to the king to be impartial. The combination of destructive power with protective justice of a non-discriminatory nature as expressed in this poem is typical of the ancient Tamil idea of valour. It was a quality to which anyone could lay claim. Another poem in Puranānūru (312) shows a valiant youth as indebted to his mother, his father, the village blacksmith and his king for his possession of the quality of valour. The poem says that it is the king who teaches good (ethical) conduct to the young hero. The intermingling of ethical and warlike qualities in this poem is characteristic of the Tamil way of thinking in the period concerned. Yet another poem (Pura: 187) says that, that country is good where the men of valour are good. Here also the ethical and social aspect of valour is evident. The concept of valour as justice found its expression not only in early Tamil literature but also in the religion of the period. An examination of Cankam literature shows that temple worship was not prevalent then. The word kottam which meant a temple occurs only three times in the whole of the Cankam literature (Cankam Ilakkiyap porul Kalan~ciyam Vol.II). Though vedic sacrifices are mentioned, they belonged to the exclusive form of corporate worship, (Encyclopaedia Britannica Vol. 19, p. 1015) and did not constitute popular religion. Since North Indian gods like Śiva and Visnu were not worshipped widely then and since brahminical sacrifices were not meant for the common people, the question arises about the identity of the gods who were popular and their relation to the supreme value of valour. There were local gods who belonged to small local communities and there were several associated with divinity. But the most important were ananku and Cūr apart form Murukan. Ananku is "an anonymous, impersonal power", (Zvelebil, p. 21). This power could take any shape it liked and move about. Several things are mentioned as possessed of ananku. Cūr is "a malicious, terror-provoking force which was always destructive" (Zvelebil, p. 16). This Cūr representing impersonal fear and general terror later came to be regarded as personified. There are a few occasions in Cankam literature where ananku and even Cūr are mentioned in connection with worship (Aka: 240, Nar: 367). It is not surprising that these terrible forces necessitated appeasement of some kind. But their mysterious indefinability did not suit socially developed religiosity or values. The socially nuanced concept of valour as developed by the bards and poets of ancient Tamil Nadu could not be attributed to such vague entities as ananku or Cūr. This called for an anthropomorphic conception of divinity and the Tamils found this in Murukan. Deification of ethical bravery started prior to the period of Cankam literature. Before valour was conceptualized and treated in literature it was apprehended in the tribal context as a symbol. For instance, there are several allusions to hero-stones in Akanānūru and Puranānūru. These hero-stones were erected in memory of men who fought valiantly in the interests of the tribal community and fell in battle. These dead heroes became objects of regular worship by their community, (Pura: 329, 335, Aka: 35, 131, 289). The references show that worship of these heroes was marked by an ethical concern. It was only the hero who died fighting a protective and not an aggressive battle that was the object of worship. Only the bravery shown in a just war to retrieve the cattle wealth of one's own community was considered worthy of religious worship. This shows a strong sense of justice even in the tribal context (Aka: 35, 131, Pura: 261, 263, 264). The descriptions of a hero-stones in these poems contain references to the installation of a spear and shield in front of the stone, (Aka: 67, 131). The stone was often inscribed with the name of the fallen hero. (Pura: 264. Aka:53, 297), and the spear was obviously the symbol of valour. The creation of countless such stones all over Tamil Nadu is thus attested from a very early period. This quality of protective valour was closely associated not with any one hero-stone but with the spear found every where. Since a quality could not be conceived as an substruction in those days it was attributed to a great man-god, the warrior-protector of all tribes, belonging equally to all of them and treating all equally. The measure of justice was the same for all peoples in the eyes of this god. Valour constituted this measure of justice and Murukan was the god who represented it. Whereas the particular god of the village on the hero-stone was of no relevance for the people of other villages and served only to boost narrow local identity, the all-Tamil conception of Murukan was inclusivist and impartial among tribes. The development of Tamil society from the tribal state required the development of such a god of a unifying nature, a god of justice for all. In Murukan the Tamils expressed what according to some sociologists constitutes the religious need of man "to bring some order (cosmos) into the universal experience of disorder (chaos)", (Encyclopaedia Britannica, Vol.15: p. 605). It can also be said that through religion man has often tried to discover an order that really exists in the universe. The above statement is true of early man's attempt in the political domain also. "In some societies religious and political structures are co-terminous. The gods of the group guarantee or represent its values". (Encyclopaedia Britannica, p. 611). It was Cūr that represented disorder and chaos in ancient Tamil Nadu. The uncontrollability of nature and the highly destructive conflict situations in primitive societies gave rise to this arbitrary, indefinable and threatening Cūr. Now no tribe could hope to pit its own particular god against the great impersonal Cūr inhabiting mountain fastnesses and moving about mysteriously. In contrast to it the tribal village gods were of limited power. They were rendered powerless with nothing to eat when their villages were destroyed in war, (Pura: 52, Aka: 307). Such a fate could never overtake Cūr since it loved to dwell on mountain tops (Aka: 303, 359, Kurun: 105, 376, Nar: 359, 373). It was impossible to establish any regular relationship of a socio-cultural nature with Cūr due its arbitrariness and vagueness. So Murukan the man-god with the well-defined social attribute of protective valour was the solution. Thus the human god of justice and order grew in importance and subdued through his valour the non-human and the arbitrary Cūr. It is to be noted here that Murukan too was associated with impregnable mountains in rivalry of Cūr and not tied down to one any locality like lesser deities. In destructiveness both Murukan and Cūr are similar. But in Murukan this destructiveness is associated with and motivated by justice and protectiveness. This is the essence of the Tamil concept of valour or use of force according to norms of justice. The appeal of Murukan was also due to his accessibility to all. 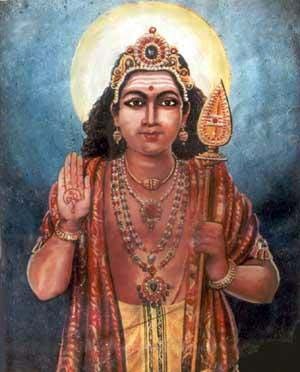 His priest, the vēlan was ubiquitous and his presence is mentioned even in great urban centres like Kaviripattinam (Pattinapālai: 154-160), and Maturai (Maturaikkān~ci: 610-615), as well as in every village or spot in Tamil Nadu (Tirumurukārruppatai: 218-249). This meant Murukan could be experienced by anyone anywhere. Perhaps this was the reason for the absence of reference to temples dedicated to him in the early period. Finally Tolkappiyam gives conclusive proof of the association of Murukan with valour of a high ethical nature. It is in the context of referring to Karantai that Murukan worship occurs in the grammatical treatise. Karantai refers to the theme of retrieval of cattle for which war is waged. It is not a war of acquisition or aggression; it is a just war of self-defence and protection. Tolkappiyar mentions religious subjects, heroic themes and worship of hero-stones only in this connection (Tolkappiyam: Porul., Purat. cuūttiram 63). The first to be mentioned here in resounding terms is the vēlan and his worshipping of Murukan who thus emerges as the great god of ethical valour. The armed might of the great kingdoms of the Cheran, Cholan and Pāntiyan is mentioned only next. Thus reference in Tolkāppiyam to the righteous valour of the Divine King Murukan is followed in the right order by reference to the righteous valour of the earthly kings of Tamil Nadu. Thus the non-Sanskritic brahminical Tamil concept of valour had a complex, socially nuanced meaning in ancient times. This deep meaning, represented in ancient Tamil religion by the god Murukan, is of great social relevance today in Tamil Nadu. The deep divisions in modern Tamil society due to the caste system have prevented the healthy growth of a Tamil identity. Conflicting caste loyalties do not make for the united advance of the Tamils on several fronts. This deplorable state of affairs can be remedied only through a cultural transformation. Since religion continues to be a very important component of Tamil culture, a rational reform is urgently needed. Fortunately for modern Tamils, their ancestors of the hoary past have already developed a religion centering on Murukan emphasising an ideal of justice that is impartial and inclusive of all. This religion and its ethical essence have to be rediscovered and the old meaning of Murukan understood once again wherever Tamils live. A.L. Basham, The Wonder that was India (New Delhi: Rupa), 1992. Encyclopaedia Britannica, 15th ed. 1979. Kamil V. Zvelebil, Tiru Murugan (Madras: International Institute of Tamil Studies), 1981. Canka Ilakkiyapporul Kalanciyam (Tanjavur: Tamil University) 1986. K.	Radhakrishnan, M.A. alias Marudhamuthu, is an active social worker and educator who has published a number of articles on socio-cultural and religious themes, especially with respect to Buddhist influence upon Tamil literature.